According to a research, more than 40 % of the food goes to waste because of storage problems across the world. The food is not kept properly in the refrigerators and as a result, it is wasted. This problem is growing in many developing countries. This wastage of food basically happens when the food is taken from the farmhouses to the different markets. The food is not stored properly during its transportation. In Nigeria, people have come up with the perfect solution to this growing problem. 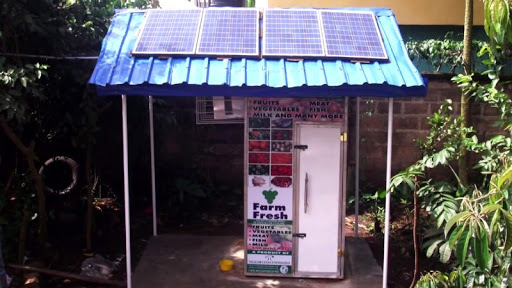 Refrigerators that are solar powered is the answer. This new invention can save so much food that one can only imagine. They have named it "ColdHubs". It is an invention of a company that is owned by a business man named, Nnaemeka Ikegwuonu. He came up with the solution when he realized that most of the food is wasted because it is not kept in a proper fridge. Farmers across the world lose more than 20 percent of their income because of this problem. There is no proper refrigerating system available in the outdoor markets either. If we look at Africa alone, we know the climate there is hot and the normal temperature is above 40 degrees Celsius. Now if the food is kept open in hot weather in the markets, obviously most of the food will be spoiled. Ikegwuonu decided to use solar energy to solve this problem. He came with a very simple design that gives preservation system for food all day long. Usually the different vegetables used to have a lifespan of only two days, now after storing in the solar powered fridge, the lifespan amazingly increased to around 20 days. What they basically do is that they put an 11.9 cm insulation where the food is kept and they use solar panels to run these fridges.